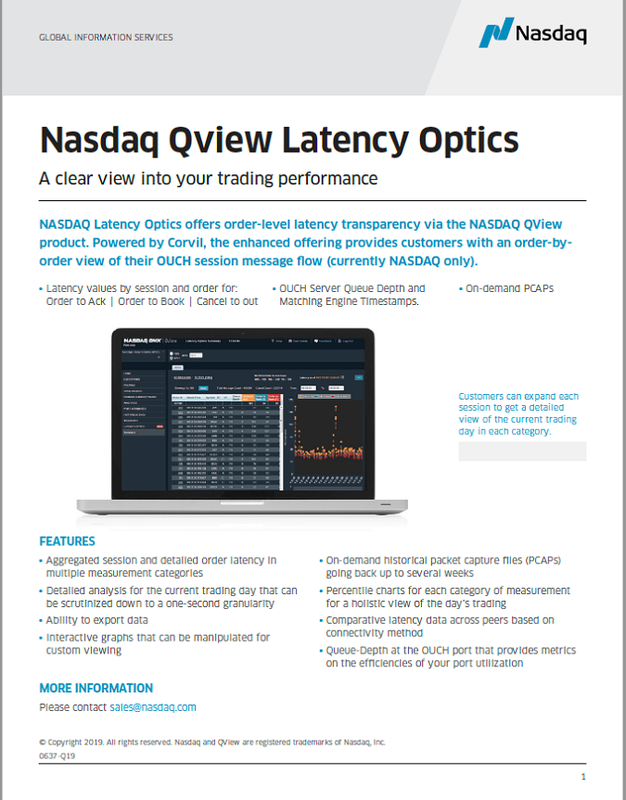 QView Latency Optics provides transparency into order flow using the Corvil system deployed in the Nasdaq Data Center. Latency Optics displays an overview of roundtrip Order to Acknowledgement, Order to Book (software & FPGA), and Cancel to Out with the ability to drill down to specific time frames. Use the Packet Capture feature to download and analyze your order detail. This function includes historical timeframes beyond the current trading day. Although the historical data is not guaranteed, it can typically go back up to 11 days depending on volumes. The PCAP feature is included at no additional charge to QView Latency Optics subscribers. QView is required to view the Latency Optics add-on. Please refer to the pricing page for more info, or sign-up here. Nasdaq QView is a web-based tool designed to give subscribers the ability to track participant order flow on The Nasdaq Stock Market (Nasdaq). 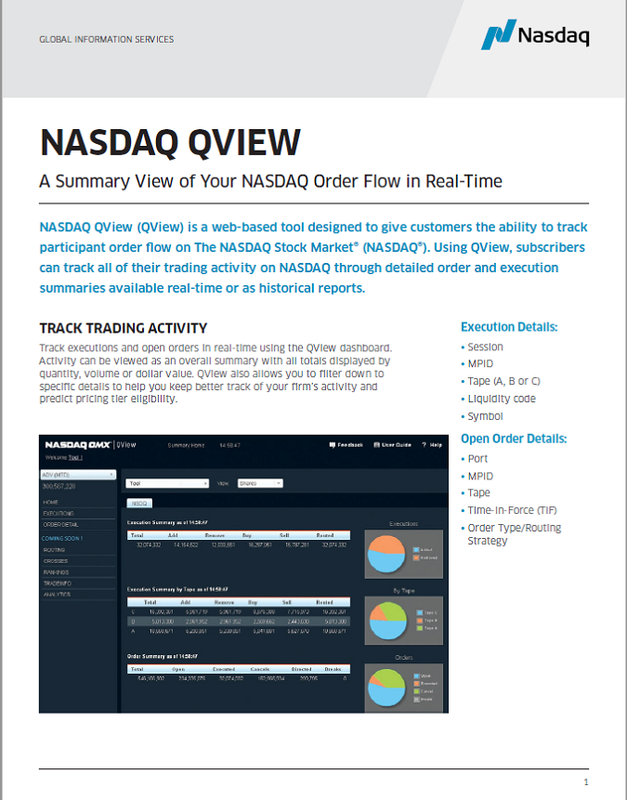 Using QView, subscribers can track all of their trading activity on Nasdaq through detailed order and execution summaries available as real-time or historical reports. 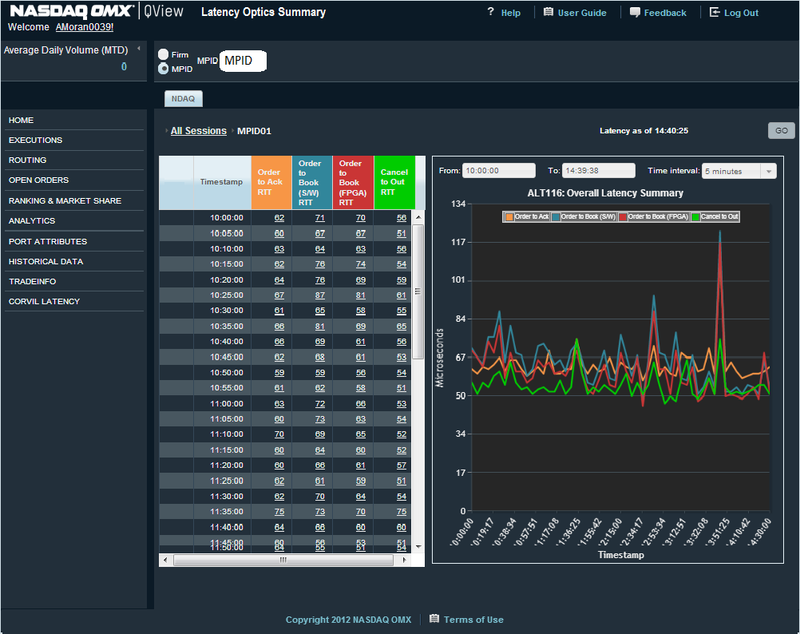 QView also includes ranking and market share statistics, routing and directed order summaries, port attributes and analytics such as time at the inside, fill rates and price improvement statistics. Track executions and open orders in real-time using the QView dashboard. Activity can be viewed as an overall summary with all totals displayed by quantity, volume or dollar value. QView also allows clients to filter down to specific details and keep better track of your firm's activity and estimate monthly billing. Provides a real-time overview of the firm's usage of the Nasdaq routing strategies and directed orders to other trading venues. A unique look into how your firm ranks in activity on Nasdaq among other participants using real-time and historical rank and market share by MPID and individual symbol. Data is available on a daily or monthly basis. Provides an overview of a firm's active ports and associated attributes. 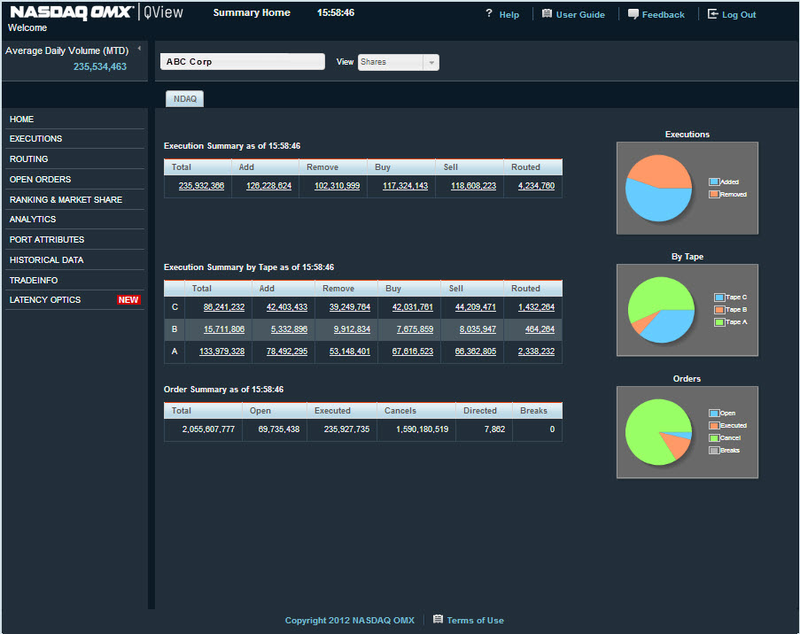 QView is available for Nasdaq BX and Nasdaq PSX for an add-on fee. Order and execution reports are now available on a rolling five year basis via the new Nasdaq Report Center.